Sitting are Happy Go Lucky Square Dance Club members Dee Frost and Martha Bradley, both of Elizabeth. Standing are ED Director Kelly Macheska; ED Assistant Medical Director Robert C. Smith, M.D. ; and ED nurses Emilee Hawk, RN, BSN, and Sheila Amati, RN, BSN. Four-time cancer survivor Martha Bradley, past-president of the club, said she "knows what pain is," and fondly remembers a stuffed dolphin a nurse once gave her during her treatment that made her "feel like someone cared about me." 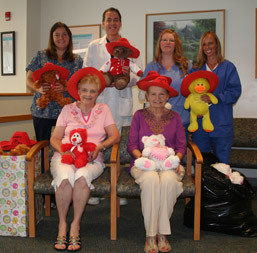 The group of 69 members bought and donated the 40 bears after being inspired by another local organization that donated stuffed animals and sweat suits to MVH's ED. "If you can put a smile on a kid's face when they are scared and don't feel well, that's the best," said Mrs. Bradley. "The kids are going to love the cowboy hats," said Mrs. Macheska. "We have not had those for kids before, and the stuffed animals really do help a lot." The Club meets at the Dravosburg #2 Fire Hall on Luscomb Lane and boasts members from Pittsburgh, the Mon Valley and other communities in the Tri-State Area.